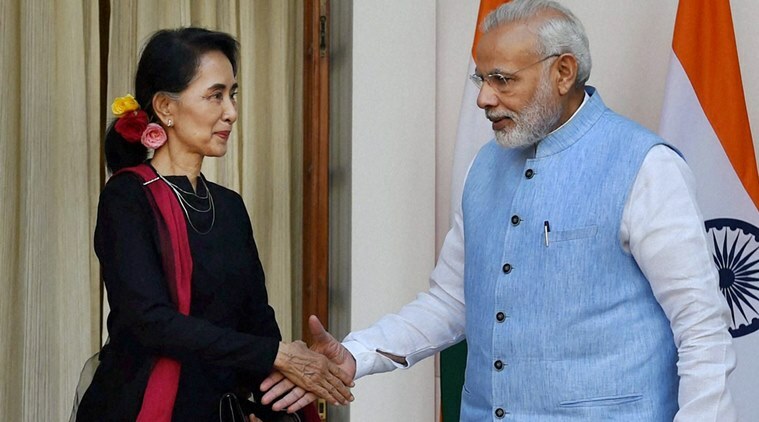 Indian Prime Minister Narendra Modi and Myanmar's State Counsellor Aung San Suu Kyi have agreed on bilateral economic cooperation over a wide spectrum. The two met in New Delhi on Wednesday. Modi invited Aung San Suu Kyi to his country for the first time since Myanmar's democratically elected government was inaugurated in March. Aung San Suu Kyi effectively leads the government. They agreed that their countries will build a road linking India to Thailand through Myanmar. India will also invest in Myanmar's power generation sector. Modi said after the meeting that India can also provide help to Myanmar in education and agriculture. Aung San Suu Kyi said India's cooperation will lead to economic development in her country. In August, China became the first non-ASEAN country to invite Aung San Suu Kyi to come since the inauguration of Myanmar's new government. India apparently wants to contribute to regional stability and curb China's influence in the Indian Ocean by offering active support to Myanmar./.